Life of a Catholic Librarian: Tea Time with Tiffany #16 - A few updates & St. Therese! 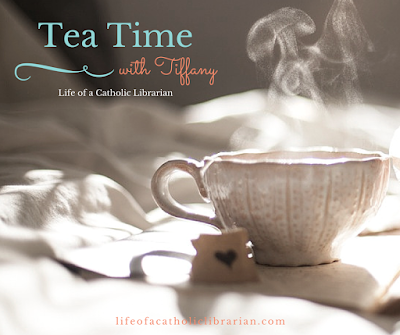 Tea Time with Tiffany #16 - A few updates & St. Therese! I've been keeping these shorter, have you noticed? ;-) Instead of 10 minutes, I've been in the 6-7 minute range the past few weeks. Once I get the podcast up and running, I'm hoping to whittle these videos back to about 5 minutes, so that they're quicker and easier for more people to watch. Working on it! At any rate, today's topic is twofold: a few updates on current life events, and my devotion to St. Therese, plus her upcoming novena! St. Therese Novena tab! Novena begins Sept. 22nd. Pray More Novenas will send out the prayers to your email! Do you have a devotion to St. Therese? Are you planning to pray her novena? Leave us a comment and let us know! Wow, the post is up early this morning. I usually read your blog on my lunch break but I noticed it in my feed reader this morning. I don't have a novena suggestion since I wasn't in a habit of praying them before joining pray more novenas and I think I've had to play catch up on almost every novena I've prayed with them. My suggestion/request is to provide audio of the novena prayers. Your St. Monica audio prayers and the ability to pray in the car helped me to pray the novena each day. Melanie, great suggestion! I should do that for the St. Therese novena, that would be easy to tack onto the end. If I have time to redo it, I will. That's a promise! Hi Tiffany! Ok so this is a bit o/t and not really sure where to post this but saw it and of course thought of you! You probably have already seen/read it but in the unlikely event you haven't...https://www.facebook.com/elizabeth.scalia.1/posts/1018942638156430. I thought of you when I saw the post! Thank you again for making the prayer podcasts- they are lovely! Love your videos! I will be joining in the novena as well. And be assured of my prayers for your family as well. I like that site with all the pictures of her. That was really cool. I never really thought of the picture thing...that is really neat. You could create a google form for people to find out with different novenas/prayers/feast days. We can even create a google calendar for them that people can subscribe to..my friend created one with all the catholic feast days on it that I enjoy. Hi Beth Anne! *Fabulous* suggestion, my dear, about the Google calendar/form! I will absolutely be looking into this for the new year. :0 Thank you! Praying the novena too! (So is my mom.) I also have a devotion to St. Rita. I have a really old novena book that was my grandmother's (her name too). That novena is in May. So, library article. It is...submitted! We'll see if they actually take it, but I'll keep you posted. 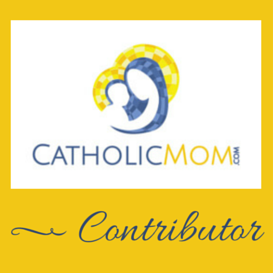 It's a review of (more) recent Catholic fiction written for adult audiences.